Any guess what airport this is? Airlines and airports are better now than they used to be. But are they really? Flashback time. Back in the late 70s my parents and I got a set of unlimited flight passes on Allegheny Airlines. This was before deregulation of the airlines, so we were limited to the region in which Allegheny operated, but that was actually quite a large piece of the country at the time. The deal was simple; fly as much as you want, you just can't return to your airport of origin until the end of the flight pass. Once you stopped back at home, you were done. The passes were good for 14 days of unlimited flights. Sure not going to see something like that these days. So, we flew and flew and flew. We went to national parks, to visit friends, to go to museums and some days it was just to fly. Our goal was to make absolute maximum use of those passes. In those 14 days I saw a lot of airports, met a lot of flight attendants (nee stewardesses) and really experienced air travel. One thing that struck me is that every airport was different. Every one had its own flair; its own personality. Another thing that struck is that most of them sucked. They were dingy and some cases actually dirty. Concrete structures set out away from everything. Amenities were scarce, if they had any at all, and for all that air travel was the mode of transportation for the "jet set", it really wasn't pretty or anything resembling fun. I also have no memories of my parents getting frustrated or pissed off during those flights. My father was a tall as I am (almost anyway) and while the seats may not have been truly comfortable, they weren't horrible. People took flying a little more seriously too. Some went overboard and actually dressed up to fly as they did in the 40s and 50s, but for the most part we didn't look, or more importantly, act, like a bunch of hooligans. Ok, so flash forward to today. 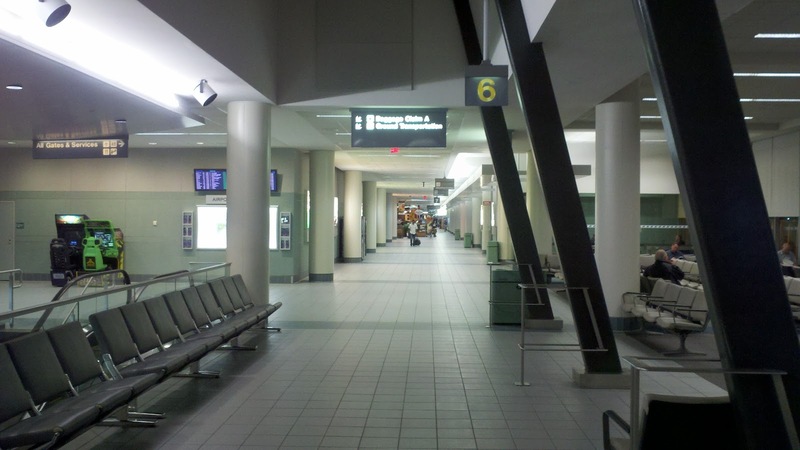 Airports are clean, and shiny and really nice; and boring. Every single airport I've been in recently looks like every other airport I've been in recently. Atlanta, Detroit, Manchester, Salt Lake City; they all look almost exactly the same. Where's the individuality? Where's the personality? As far as I can tell, it's all gone. The fact that they are all clean now (at least, all the airports I've been in lately) is definitely an improvement, but the loss of personality just seems sad. There are small differences. When I checked out the Dunkin Donuts in Atlanta (and I was surprised to find one so far from Boston, being a northeast regional company) they had local flavour added to their regular menu; like a fried chicken and biscuit breakfast sandwich. At the same time, the prices for everything in the airport are ridiculous. They have a captive audience and they know it. I ended up getting a sandwich and a bottle of water for almost ten dollars. On top of that, the sandwich was precooked and heated up in one of the new convection ovens almost all fast food places are going to. I suppose it's better than everything being microwaved, but at the same time, why is it so hard to find a place that actually cooks their food on site, instead of just reheated precooked, prepackaged food. You're basically paying $10 for something that you used to get out of a vending machine at a rest stop on a highway. Just with a table in a well lit (and boring) food court. Part two of that is the frustration and inconvenience. Flying the 70s was a treat and not something people did every day; it seemed something people took more seriously. Today the number of people who spend most of their time flying angry is quite sad. Why, when it costs so much, has customer service fallen off so badly. When I was in Detroit on one of my layovers I stopped at the Delta counter to see if I could switch into the bulkhead aisle seat for my next flight. It's about the only seat on one of the little regional jets that I can sit in and not have my knees in massive pain before the end of the flight. When I approached the counter and asked about getting my seat moved the attendant there just said "Why, what's wrong with your current seat?" in a rather nasty tone of voice. I explained my height issue (not that me standing over a foot taller than her shouldn't have been a clue) and she replied that the seats had already all been assigned. Note; she didn't look to see if this was the case; she flipped a couple of bits of paper on the counter and just dismissed me. Being that she had just arrived at the counter I knew she hadn't looked to see what the state of the seating was yet. I just shook my head and walked off. There was no value in arguing or getting angry at that situation; it wouldn't have helped. This hasn't been the case every time I've flown, certainly. I've had more pleasant conversations than negative, but the negative ones certainly punctuate a long day of travel when you spend too much of that time very uncomfortable. I have to note that, every time I've talked to them, the counter staff in Manchester have been wonderful to deal with, even at 5:00 in the morning. Polite, friendly and helpful; thank you. In the end, there are positive changes to air travel and some which are not so positive. Safety improvements (and I'm talking real safety) in flying are certainly appreciated and the fact that everything is clean is greatly appreciated. I think in some ways the magic is gone though. I don't think it's necessary to go back to the days when people dressed up to fly (although it would be nice if people could shower and maybe wear clean clothes before going to the airport), but for all the positive changes that have come to air travel over the decades, just as much has been lost. Oh, and here's a tip for those out there that don't fly regularly; when boarding the plane take your carry-on bag off your back and hold it in front of you as you walk down the aisle. This will help you keep much better control of your luggage and keep from smacking people in the head as you pass. The aisles are very narrow and a backpack or shoulder bag slung over your back is likely to hit people. Carried in front that doesn't (usually) happen. Any guess what airport this is? No way to tell, really. 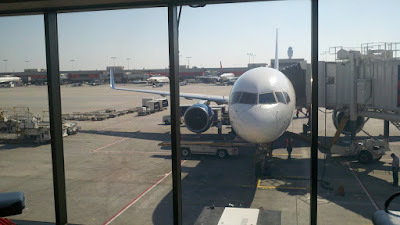 I will admit though that I really like the invention of the jetway. I have clear memories of walking across the runway to get to the plane in all sorts of weather to climb the roll up stairs into the plane. Sure, it was like an old movie, there was something cool about that at first, but it got old fast.